People in higher income brackets: they're just like us. For example, they're still going to The Hamptons this summer, but they're going to be toning it down. What, you've heard this story before? Personification of The Hamptons as mystical Lost-island like entity. Also, appearances: they count for something! "..the important thing is that everything seem low-key. 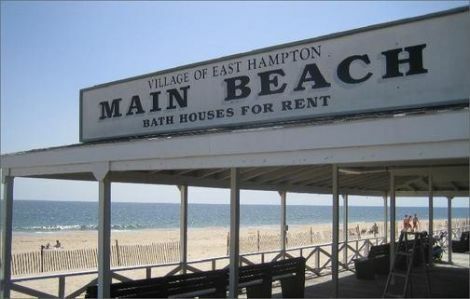 The Hamptons wants you to perceive it as conforming to the spirit of these hard times and not to caricature it as the flashy, traffic-choked, over-the-top playground it has increasingly become." Restaurants are throwing down on cheap booze to sweeten the deal. "Dinner for two at Della Femina will set you back $150 - but the restaurant is throwing in a free glass of wine." The most fun they might have all summer is in coming up with awesome euphemisms: "Boutiques are calling themselves "beach shacks" but still selling $200 slacks." Patterns of patently ridiculous spending might actually be slowing: ""I didn't order the $2,500 Italian backgammon board this year, which I sold three of the summer before last," she said." The operator of what is shaping up to be one of the season's hot new clubs envisions a sound system that pumps out the ambient vibe of breaking waves and squawking gulls. Caw! Caw! Polly want a dollar! Sure, there's more, but you know the routine: people who used to not have to save are trying to save, and watching them do it is totally newsworthy, because they concessions they make are amazing. On 145th Street in southeast Queens, just south of Linden Boulevard, attached brick homes with tidy, fenced-in gardens stretch into the distance. Children play tag under blooming oaks. But 8 of these roughly 50 homes face foreclosure; 4 are vacant; 2 have plywood boards nailed over punched-out windows. "My district feels like ground zero," said City Councilman James Sanders Jr., an African-American who represents hundreds of blocks in Queens like this one. "In military terms, we are being pillaged." I'm swearing, right now, to never read another one of these goddamn stories again until it contains one or more of the following items or variations of them: the snacking on of beach towels, riots at Nick and Toni's, Billy Joel-related brutality, The Surf Lodge being overrun by actual surfers, the Hampton Jitney being hijacked by various New School/NYU protesters, the Guest of a Guest-ers drop-kicking their way into Pink Elephant, Grey Gardens-esque summer shares for Upper East Side families to hide their batshit cousins, improved stronger-faster-scarier Montauk Monsters, etc. Times, 'ball's in your court. Please run with it.